Not many portable audio players come with line-in recording for converting music from external sources to MP3 files. Least of all cheap-looking plastic models that weigh just 37g. The Alneo DAP from Victor Japan does just that. It's available in two capacities costing ¥15,000 (£62) for 1GB or ¥19,000 (£79) for 2GB; both models sport a three-line OLED screen. As well as direct MP3 encoding, it includes an external microphone that enables it to double up as a voice recorder. 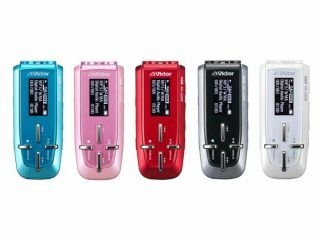 Although the voice recorder operates in mono, the MP3 recording more than compensates, with encoding rates from 96-160kbit/s supported. WMA, including DRM 9, is supported. And this - when coupled with 20 hours of battery life per charge - makes for a very capable little machine that will, of course, flop totally in the face of the mighty iPod.